Major John Henry Deane of the 2nd Battalion, the Hampshire Regiment. 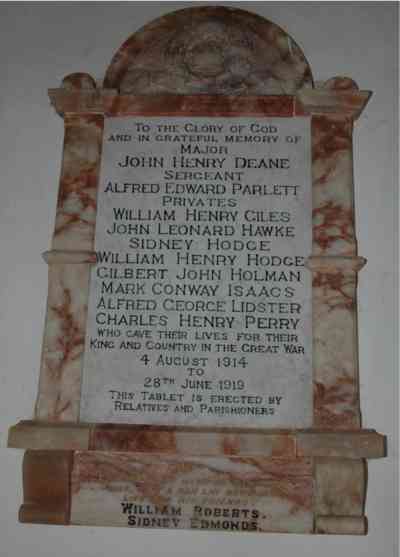 Son of the late William and Matilda Deane of Fareham; husband of Iris (formerly Deane) of Bournemouth. Born in Fareham, Hants, in the June Quarter of 1874. Died 30 April 1915 aged 41. 240283 Sergeant Alfred Edward Parlett of the 1st /5th Battalion, the Devonshire Regiment. Son of Alfred and the late Jane Parlett. Born in Afonwen, Flintshire in 1894. Died 20 November 1917 aged 21. L/4937 Private William Henry Giles of the 16th (Queens) Lancers. Son of the late John and Elizabeth Giles, formerly of Cornworthy. Born in Cornworthy in 1897. Died 21 February 1915 aged 19. 5105 Private John Leonard Hawke of the 1st.7th Battalion, the Worcestershire Regiment. Son of Albert and the late Mary Hawke. Born in Cornworthy in 1897. Died 22 September 1916 aged 25. Buried in Cornworthy churchyard. 49184 Private Sidney Hodge of the 2nd Battalion, the Northamptonshire Regiment. Son of John and Edith Hodge; brother of William (see below). Born in Halwell in 1900. Died 27 May 1918 aged 18. 3/6561 Private William Henry Hodge of the 2nd Battalion, the Devonshire Regiment. Son of John and Edith Hodge; brother of William (see below).Born in Halwell in 1895, Died 11 August 1916 aged 21. 12029 Private Gilbert John Holman of the 10th Battalion, the Devonshire Regiment. Son of John and Elizabeth Holman. Born in Cornworthy in 1889. Died 24 April 1917 aged 27. 35054 Private Mark Conway Isaac of the 23rd Battalion, the Northumberland Fusiliers. Son of George and Mary Isaac. Born in Beauleigh, Hants in 1879. Died 9 April 1917 aged 38. 33358 Private Alfred George Ledster of the 5th Battalion, the Royal Berkshire Regiment. Son of Mrs. E. Speed (formerly Ledster) of Mount Pleasant, Cornworthy. Born in Dawlish in 1898. Died 17 May 1918 aged 20. 273186 Private Charles Henry Perry of the 17th Battalion, the Royal Scots Regiment. Son of William and Sarah Jane Perry of Glebe House, Cornworthy. Born in Halwell in 1897. Died 19 October 1917 aged 19.